Anchor for iPad resembles its iPhone counterpart in most ways: the basic recording workflows and tools are all available here, so existing Anchor users won't have any trouble navigating the app. One major change is that the iPad version loses access to the full database of Anchor podcasts for listening. While I'd prefer the iPad app retain full functionality from the iPhone, the message behind this move is clear: the iPad app is all about content creation, not consumption. This different focus between iPad and iPhone versions extends to the fact that the new editing tools are currently iPad-exclusive. Anchor says it may expand them in the future to its web and iPhone apps, but for now at least, if you want to edit your Anchor show without needing an external app, you'll need an iPad on hand. Anchor's editing tools are extremely simple, which is fitting for an app that prides itself on simplicity. When assembling an episode, you can tap the '...' icon next to each clip to see two editing options: the first enables trimming the clip to the exact start and end time you prefer, while the second lets you split recordings at several points into multiple clips. The interface for these features is intuitive and user-friendly, with clearly labeled buttons and a nice pinch to zoom feature for making the most minute changes possible. 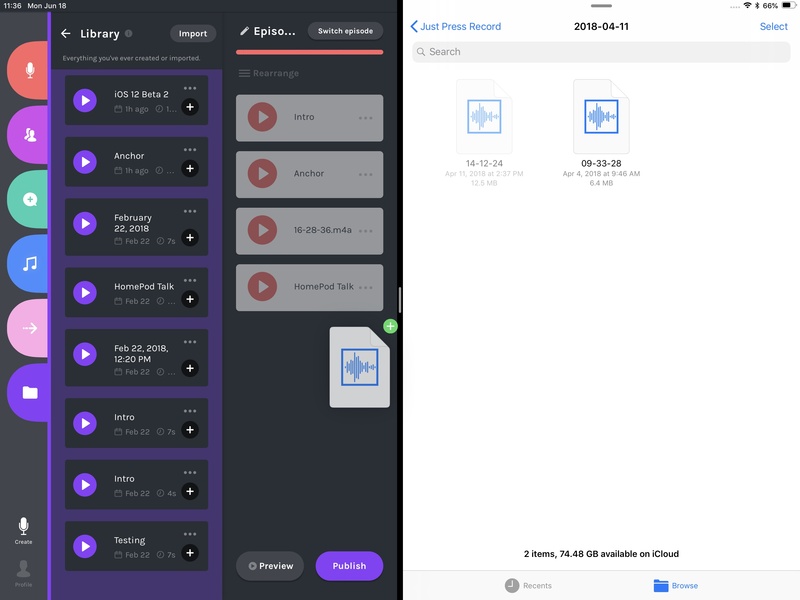 There's not much more that needs saying about these tools, except that they should lead to higher quality podcasts, while drastically reducing the number of times Anchor users need to re-record something. Anchor for iPad arrives with all the bells and whistles that iPad professionals expect from quality apps: support for Split View, drag and drop, and all sizes of iPad Pro, along with great UI layout in both landscape and portrait orientations. 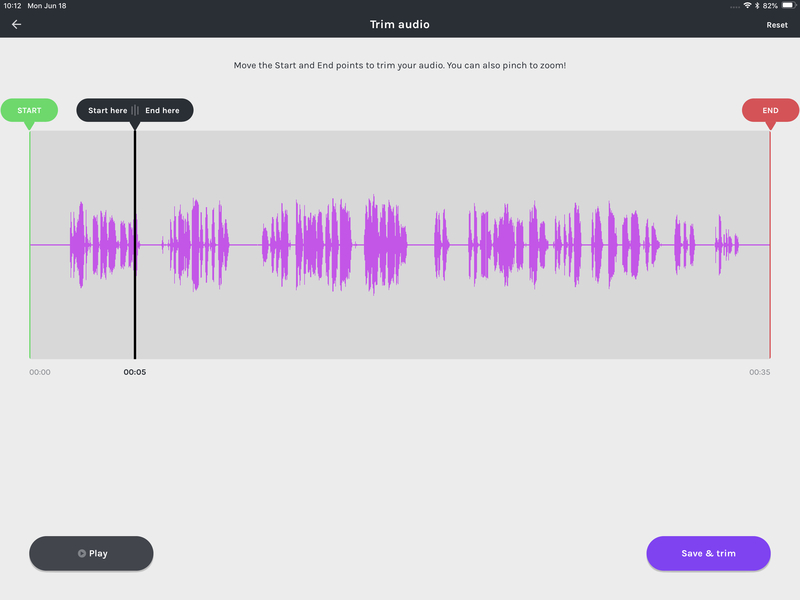 Drag and drop can be used to easily drop in recordings stored in places like the Files app, making for convenient import of audio you recorded in another app. 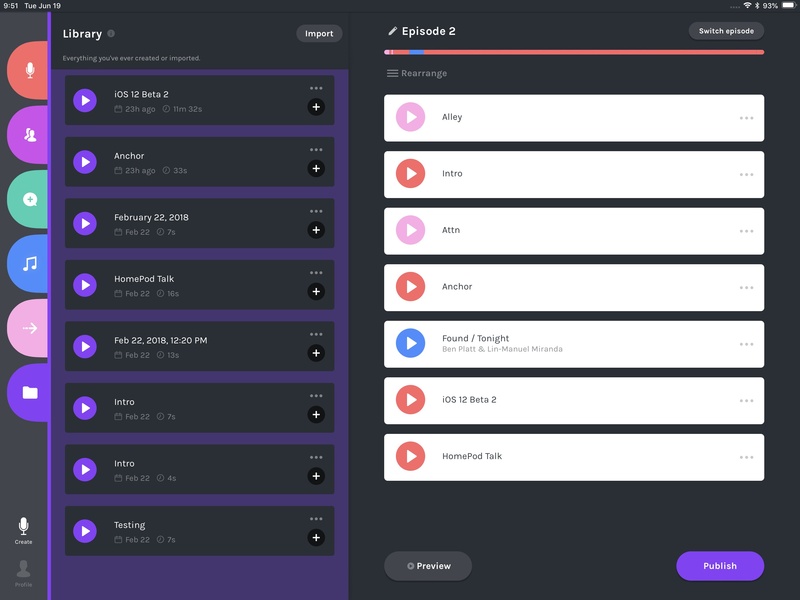 You can also use drag and drop as a quick way to add recordings from your Anchor library to just the right spot in an episode you're working on. Finally, it's put to use inside the episode builder for quick clip rearrangement. All of these touch-powered options make podcast creation feel more intuitive and accessible than ever for a novice like myself. The iPad app does a great job adapting to your current screen setup, providing easy access to all necessary tools even in cramped conditions. Even in 50/50 Split View on the 12.9-inch iPad Pro, you're able to access all panels from the full screen app and work with no compromises. The only situation Anchor doesn't work well is as the smaller app in a 70/30 split – you can't access the episode builder or your profile unless Anchor's given more screen real estate. Podcasting from the iPad has always been difficult due to various system limitations, and despite years of major new iOS updates, there haven't been any meaningful improvements on that front. What Anchor has built feels like the way iPad podcasting is meant to be done – no fuss, no frills, just an easy to use tool that gives you just enough power to make a great podcast. Anchor's iPhone app was already a solid way to record and publish shows, but the iPad feels like a much more fitting work environment for when you want to take the time to create something special. Anchor is available as a free download on the App Store.